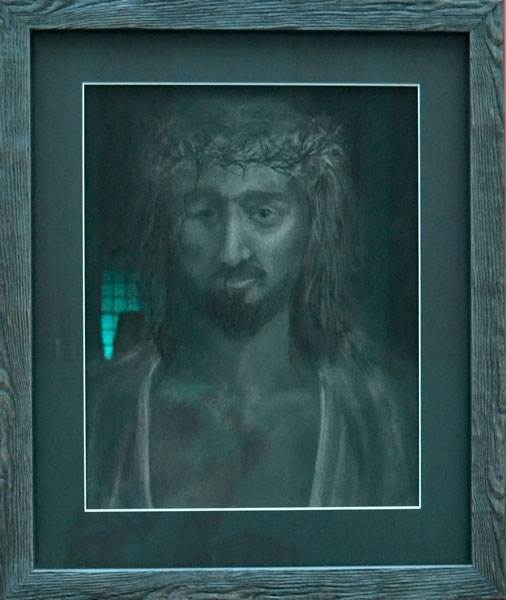 Through many centuries artists have regularly pictured the biblical stories as happening in their own settings, with the people in the stories, including Jesus, visualised as belonging to the artist’s own ethnic group. 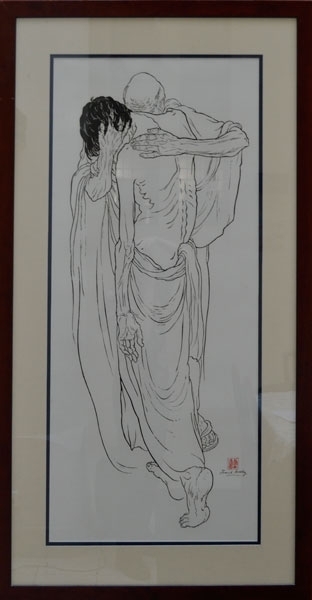 This was something that David Binns often did, particularly in his “Saints from the Suburbs” series, three of which are on display here. 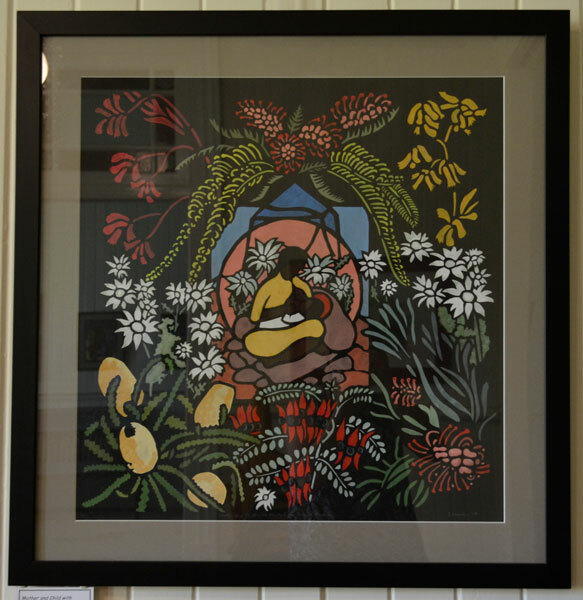 This approach is also seen in some of the gouache stencils by Geraldine Wheeler, including “Mother and Child with Australian Native Flowers”, and Jennii Gould, writer and illustrator of children’s books, has chosen to show the delight of Australian native animals as they encounter the Christ child. 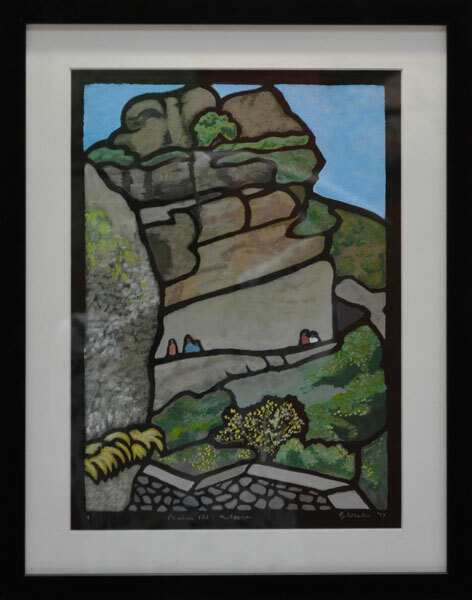 Some of the other work in this exhibition draws upon the local setting in other ways, relating to family Christmas celebrations or expressing more personal experiences of the time of Advent moving towards Christmas. The works of Gwenda Branjerdporn depict the ways that her grandchildren celebrate, Bernice Ross reflects on the world beyond the window and we see the themes of death and new life/birth in the work of Virginia Hasker, “New Life from Old”, and Jennifer Long’s “Advent Journey (Day and Night)”. 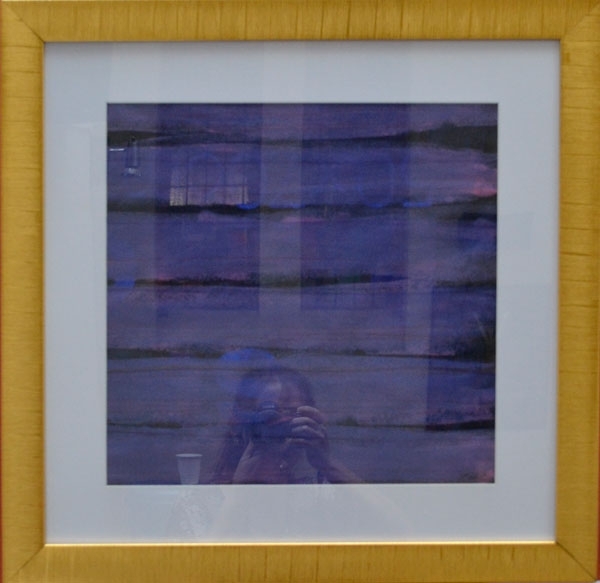 This latter work explores the spiritual depths of facing both death and birth as an Advent experience, reflecting this also by using the purple jacaranda colour which we see around us at this time in the branches above and the fallen flowers below the trees. In Geraldine Wheeler’s “O come, O come, Emmanuel” depicting the choir singing Christmas carols in the Queen Street Mall (a bit out dated since the latest building changes), we see another local setting for Advent and the prayer which many Christians sing at this time. The mother and child theme is viewed in parallel ways as we look at David Binns’ “Madonna and Child” in a Brisbane setting and Gabriella Veidt-Wiedmer’s “Safe” which reflects the enormous dilemma for refugees across the world today. 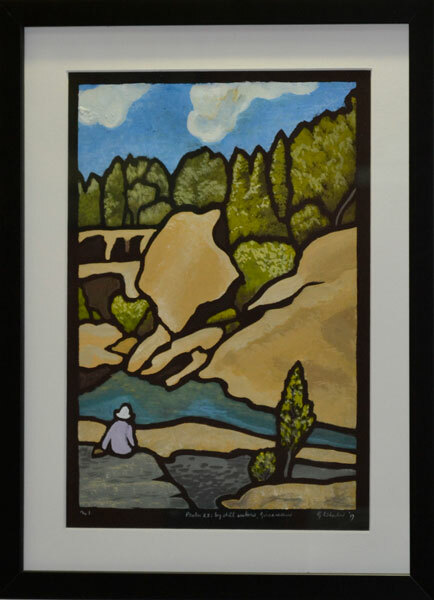 We often see the sign “Jesus was a refugee” outside churches and David Binns’ “Flight into Egypt” suggests the Holy Family about to catch a Queensland Rail train to escape. Four of the works use both words/letters and images to express the artists’ thinking. 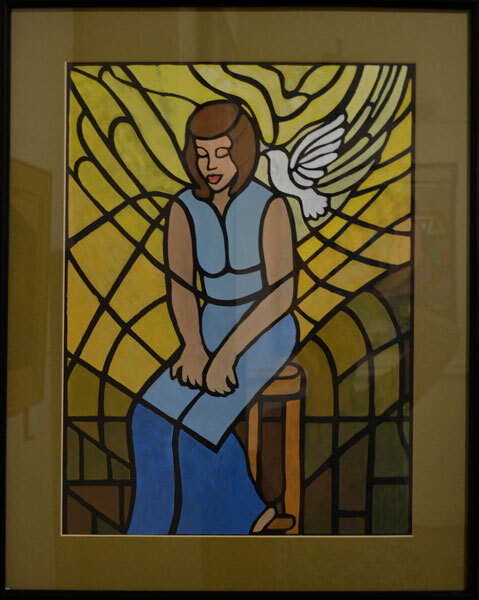 Two of David Binns’ works, “The Word Became Flesh” and “Mary’s Song”, do this as does also “Peace Angel” by Karen Hales. 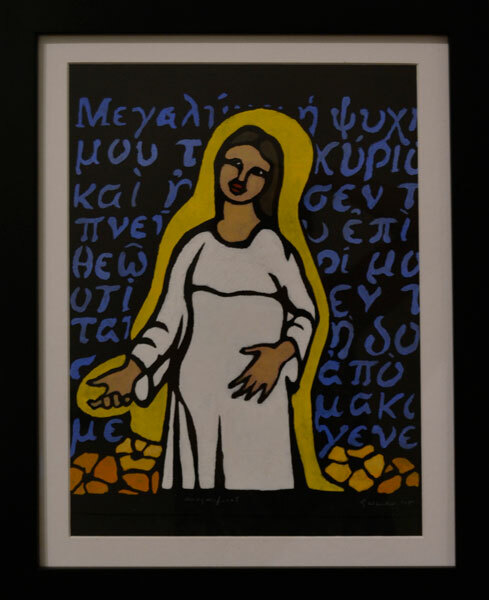 Geraldine Wheeler’s “Magnificat” places the Greek text from Luke 1:46-47 behind the figure of Mary. 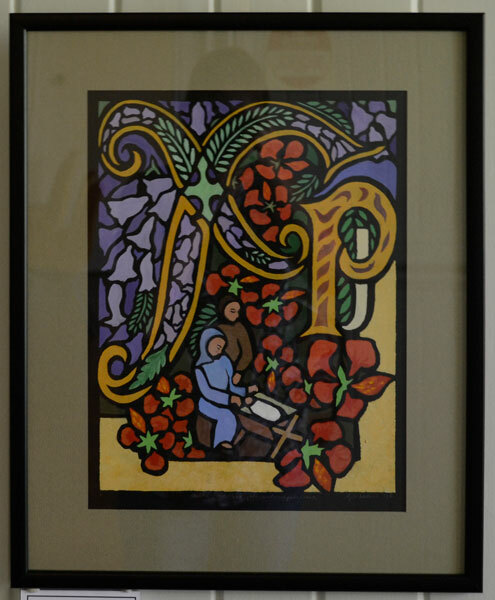 Her “Chi-Rho: Jacaranda and Poinciana” also uses the Greek letters which are transliterated as Chr and are regularly used to summarise the title, Christ, as in the abbreviation of Christmas as Xmas. 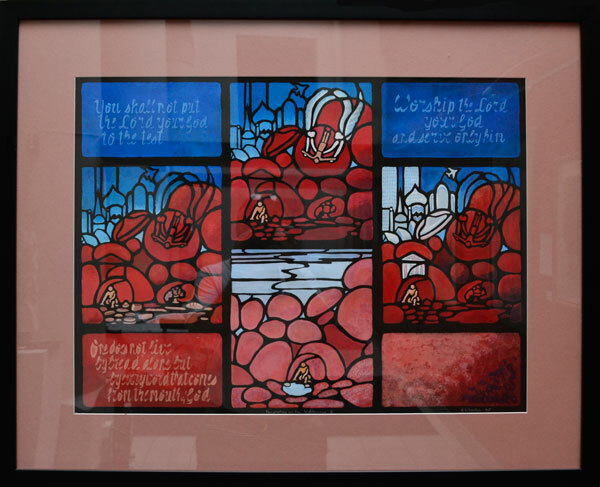 This reflects back to the large pages in the mediaeval manuscripts, the Lindisfarne Gospel and the Book of Kells, where the highly decorated, so-called “chi-rho pages” introduce the verse in Matthew’s Gospel chapter 1:18, which begins the section telling of the birth of Jesus, the Christ. Other works in the exhibition point to the mystery of the work of God in Christ in more abstract ways, as do those of Kerry Holland, for whom the crochet doily carries much symbolism. Jenny Phillips’ explorations in colour express a wide range of feeling associated with colour for many people, some highly celebratory, others more sombre. In the entry vestibule we can also find ourselves in the midst of the roadside grasses and flowers as seen by Gabriella Veidt-Wiedmer as she walked a camino in Switzerland, her home country. The Advent journey is to be one of prayer as well as a time of hectic preparation and shopping. Finally we have the ceramic works of Rita Ringma which, in their three dimensional form, show us another way we are able to express the deeper meaning of Christmas in the way that we use decorations in the home and the other places where we celebrate. 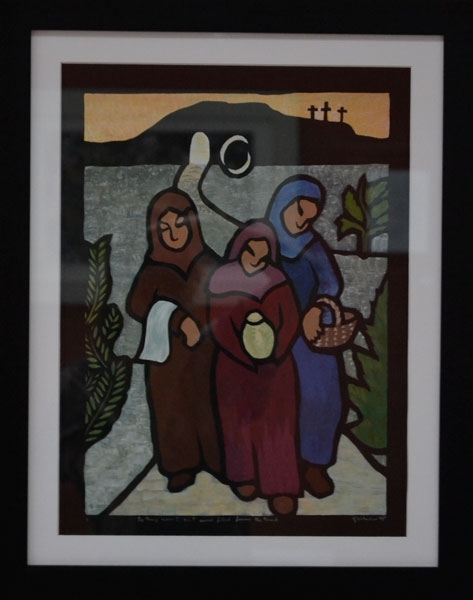 This exhibition by artists from the ecumenical group known as Visionaries at the Brookfield Centre for Spirituality, the Old Friary, enables not only an Advent celebration towards Christmas, but also, a celebration of the work of one of our founding artist/advisors, Rev. David Binns, long associated with this centre, and also an artist who had the passion for visualising the biblical story in his local setting. Our thanks to all at the Brookfield Centre who have made this exhibition possible. 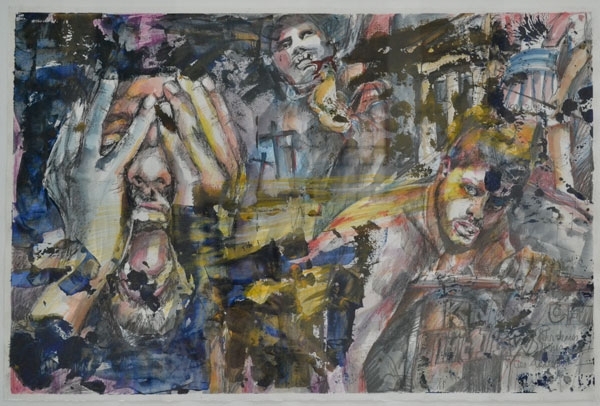 In this exhibition we find works specifically referencing the Last Supper and other biblical stories or Psalms through to the depicting of community gatherings at the table, metaphorical interpretations of the table and satirical critiques of how modern society has often destroyed table fellowship or community. 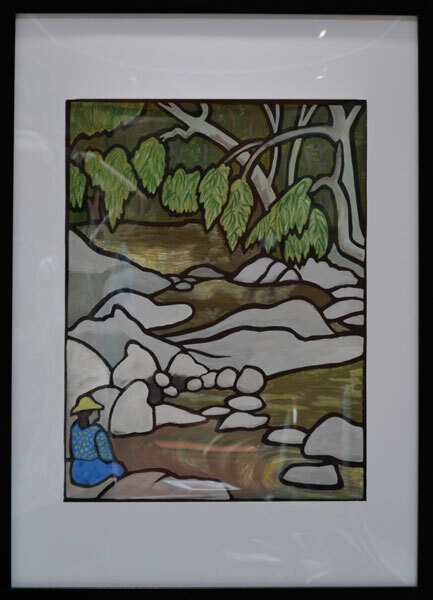 Originally it was planned that the exhibition would include a group of paintings by indigenous women artists with the theme of bush tucker, on loan from St. Andrew’s Uniting Church, but these could not be included with the change of dates for the show. 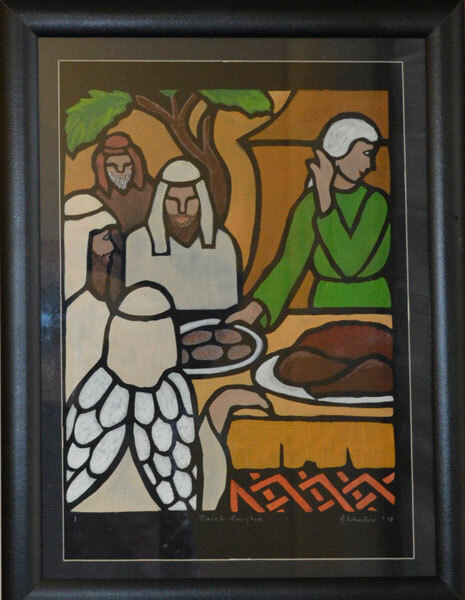 The large icon by Murhaf Obeid presents to us the biblical story of Jesus’ last supper with his disciples in a painting similar to traditional iconography. The accompanying artist’s statement also draws our attention to how we as readers/viewers of the icon story may make personal identification with the attitudes and behaviours of the different disciples, just as he makes specific reference to the present day Christians of Syria and their reactions under the major difficulties of persecution and civil war. 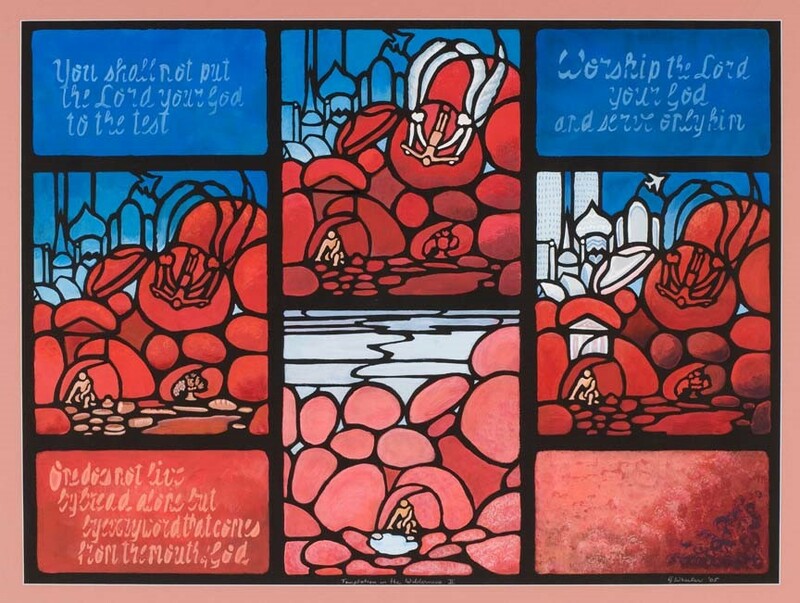 Dianne Minnaar’s Gather the Fragments leads to reflection upon the story of Jesus’ feeding of the multitude (John 6: 12-14). Reflection on the story of the last supper has led Susan Pietsch to ask about the place of women (or their apparent absence) in that story and questions of exclusion and inclusion. Gregg Nowell’s thoughts take the direction of asking about everything that followed Jesus’ last meal with his followers. 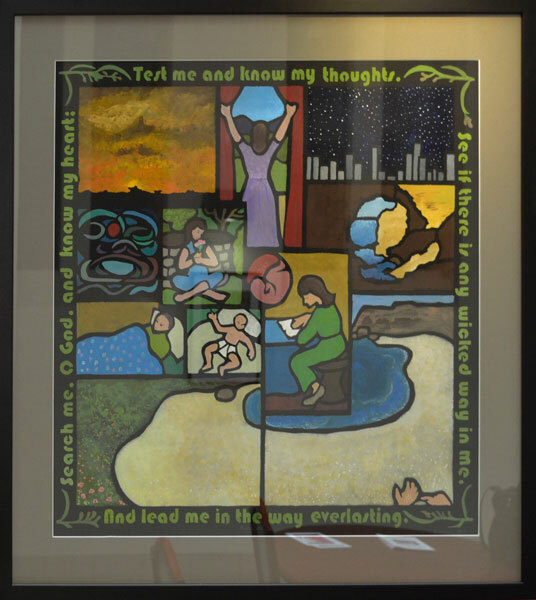 Tricia Reust has two works with such background thoughts, Supper Invitation and God’s Tablecloth, the latter reflecting on the whole earth as the place of God’s meeting with people at the table. Peter Hunter’s Come to the Table also carries this invitational theme with a blue labyrinth line weaving in and out upwards towards the table. These thoughts also may make reference to the communion table and the invitation heard in the service of worship. The Psalms are the reference point for Jennii Gould, Psalm 23:5, the table prepared even in the midst of dark experience, and Geraldine Wheeler, Psalm 84, where the lovely dwelling place of the Lord is pictured as an Australian bush chapel. 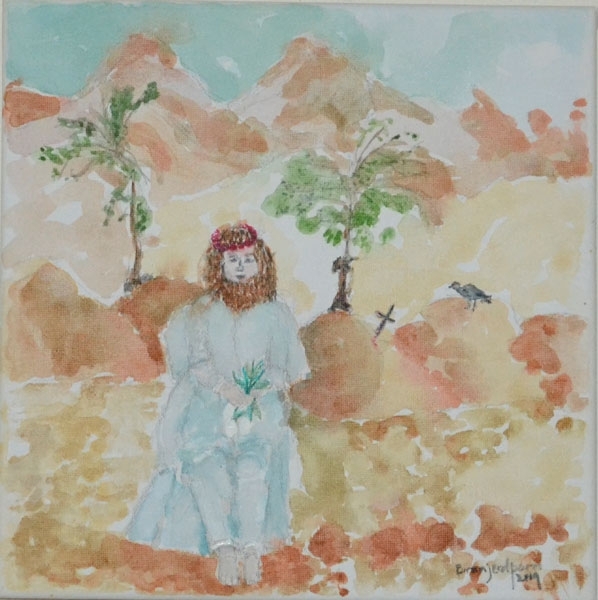 Geraldine also makes reference in two of the “Picturing biblical women” series to the table: the table of hospitality offered by Abraham and Sarah to the three angelic visitors (Genesis 18:1-15), the depiction of which, through many centuries developed into the Rublev Trinity icon to which Ruth Elvery makes reference in Trinity Invitation: Thanks to Rublev and Rohr; and the visit of the Syrophoenician woman to Jesus asking for her daughter’s healing, arguing boldly that even dogs can access the crumbs under the table (Mark 7:24-30). Ruth’s other work, All Equal at His table…looks from above onto the circular gathering. 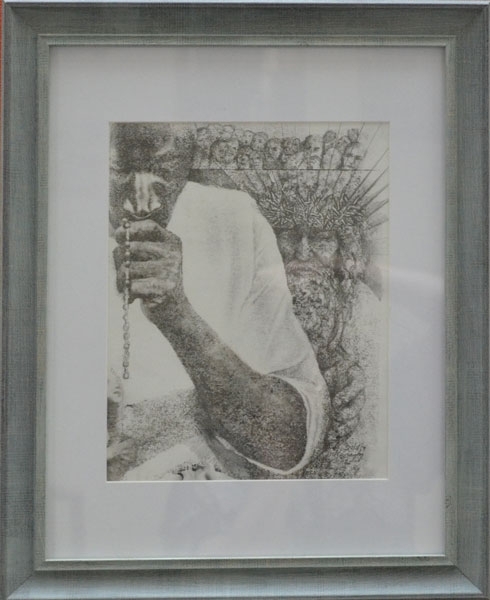 A range of artists have drawn upon memories of the table at family gatherings, both directly and symbolically, showing particular items of personal significance for themselves, jugs, bowls, lace crocheted table mats and other such items. We see this in the work of Jennifer Long and Kerry Holland. 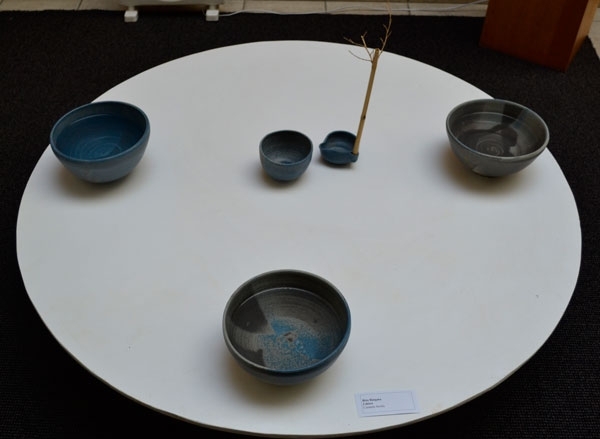 Kerry also provides the hand made objects, the stoneware bowls. 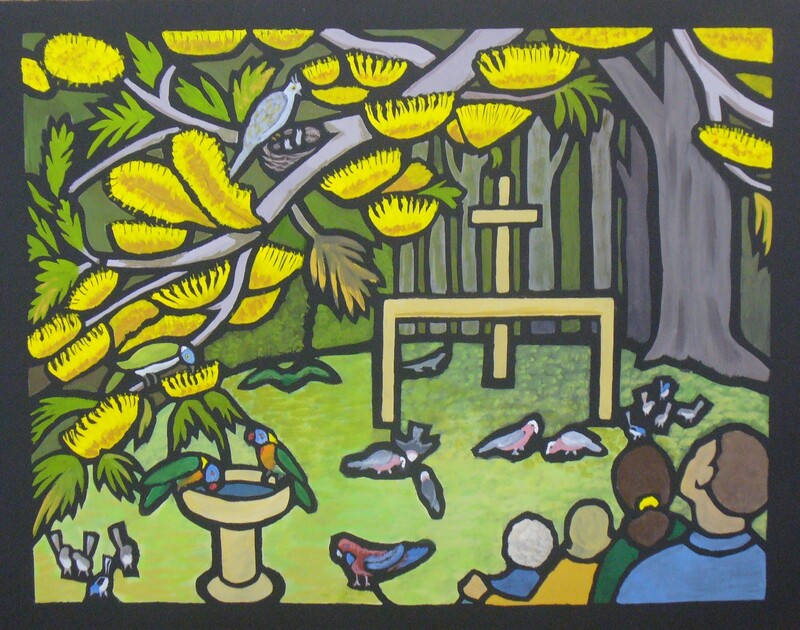 Sue Oliver gives us a series of table ideas and symbols, connection, preparation and hope, providing the visual scenes as the symbolic. Wayne Singleton brings us the laughing group gathering for a meal in present day Graceville, showing the table as a place of community enjoyment. The table can also be a place of sadness as one who has departed is remembered, as in Barb Niczynski’s Leaving the Table. Her small, detailed The Autopsy Table (a provocative title) is interpreted as a metaphor for the Christian’s daily dying and rising with Christ. In today’s world, the table as the place of family gathering and sharing has virtually disappeared for many people. Marcelien Hunt makes ironic, visual comments or poses questions to the viewer about current attitudes towards the table as the place to share (fast?) food or to engage in Bible study. Marion McConaghy’s The Table’s Journey is her reflection on the experience of what has seemed solid and stable in life suddenly flying away. So much visual art is not aiming to be mimetic of visual objects or landscapes, but it is part of the artist’s own narrative and personal expression. To this point in this catalogue essay the aim has been to discuss the diversity of thinking and approach amongst the artists, while at the same time understanding that each approaches life and the making of works of visual art from a personal position of Christian faith, as do all the artists in Visionaries. However, there is also an enormous diversity in the artists’ use of media, chiefly in work to hang on the gallery walls, but including the stoneware of Kerry Holland. 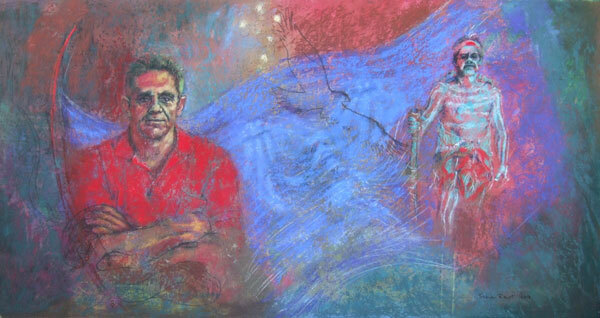 Much of the work is on canvas, in oils or acrylic or mixed media. 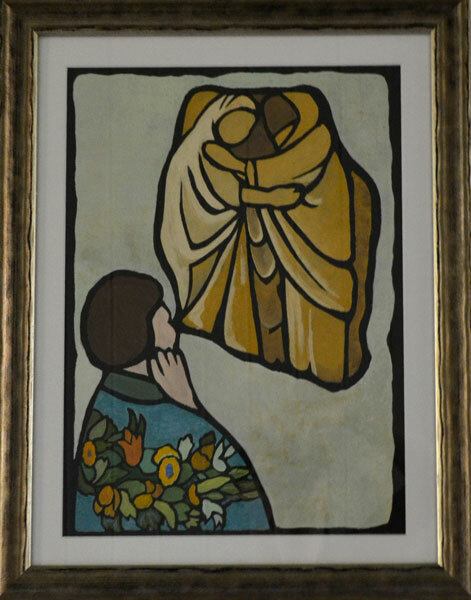 The works closest to traditional icon style are worked in acrylic paint on canvas rather than egg tempera on board, but they include the use of gold leaf to provide the golden glow only that can give. There is work on ply board and also work on paper, drawing with pen and watercolour, gouache stencil painting and the hand coloured linocut print. All members of Visionaries also wish to take this opportunity to express thanks to Assoc. Prof. Lindsay Farrell, an advisor to Visionaries since its beginnings in 1998, for facilitating these opportunities to hold exhibitions at the Australian Catholic University almost annually since the university moved to Banyo. 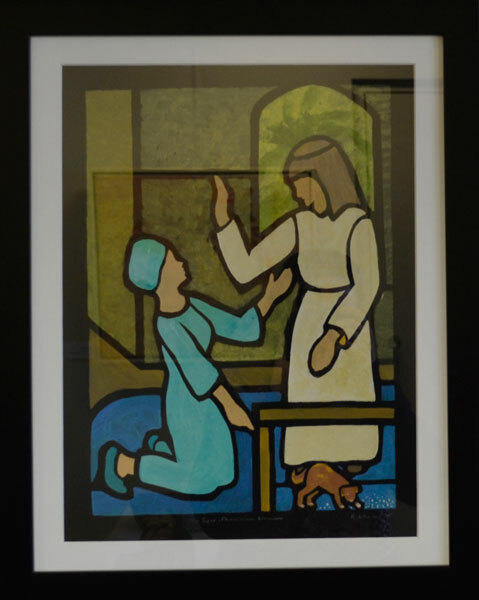 These exhibitions have been held, firstly, in a gallery space in the art department, then upstairs in the foyer area near the theology department and the offices, and most recently in the P. W. Sheehan Gallery. 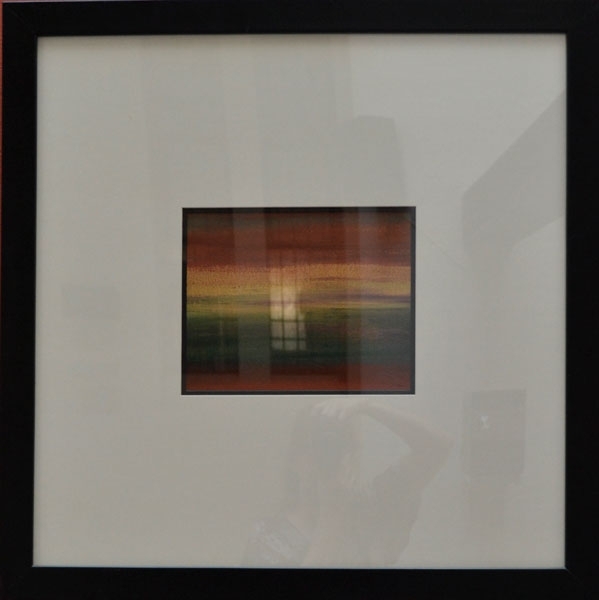 He has also often included his own art work in these exhibitions. We pray for God’s blessing upon the projects that Lindsay plans for his retirement which will no doubt continue to include his own visual art work and making opportunities for the reflective “camino” experience in a variety of ways. Lindsay, we all thank you for all you have done. The Journey to Christmas theme is interpreted by the artists of Visionaries for this exhibition in a range of different ways. Some make reference to the biblical story, particularly as told in Luke’s Gospel, chapters 1 and 2, featuring Mary and Elizabeth, Mary’s pregnancy and the journey to Bethlehem where Jesus was born. The Chi-rho pages hark back to these pages in mediaeval Gospel books (the Book of Kells and the Lindisfarne Gospel) where these Greek letters are decorated on pages at the beginning of Matthew 1:18. The journey of the wise men (Matthew 2:1-12) is also referenced. The opening of John’s Gospel, with reference to the Word made flesh, is central for some of the artists. For some artists, reflection on this story is linked with parallel events in today’s world. 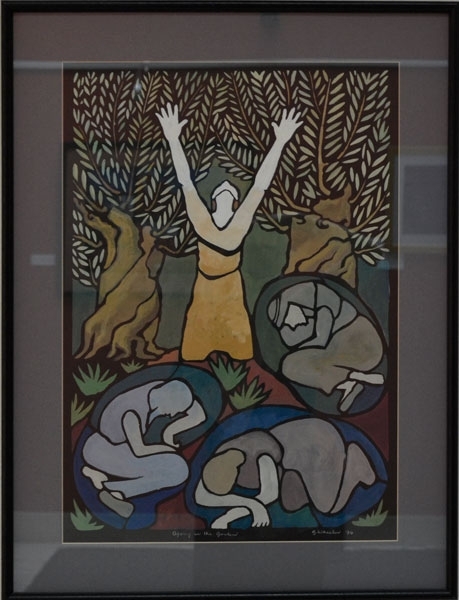 Some of the works refer to the artist’s own particular journey towards Christmas and thinking about the mystery of God’s action in the incarnation. 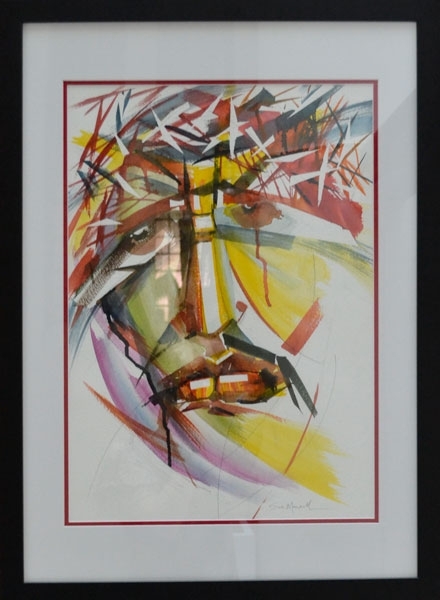 Several of the works make reference to past Christian traditions and how these may be brought into the present and used for reflection about our times. Questions facing the world and the church today come to the forefront for a number of the artists as they express issues and concerns. Every artist is aiming to express more than simply making an aesthetically pleasing image. Much is intertwined in our lives as we move through Advent towards Christmas. 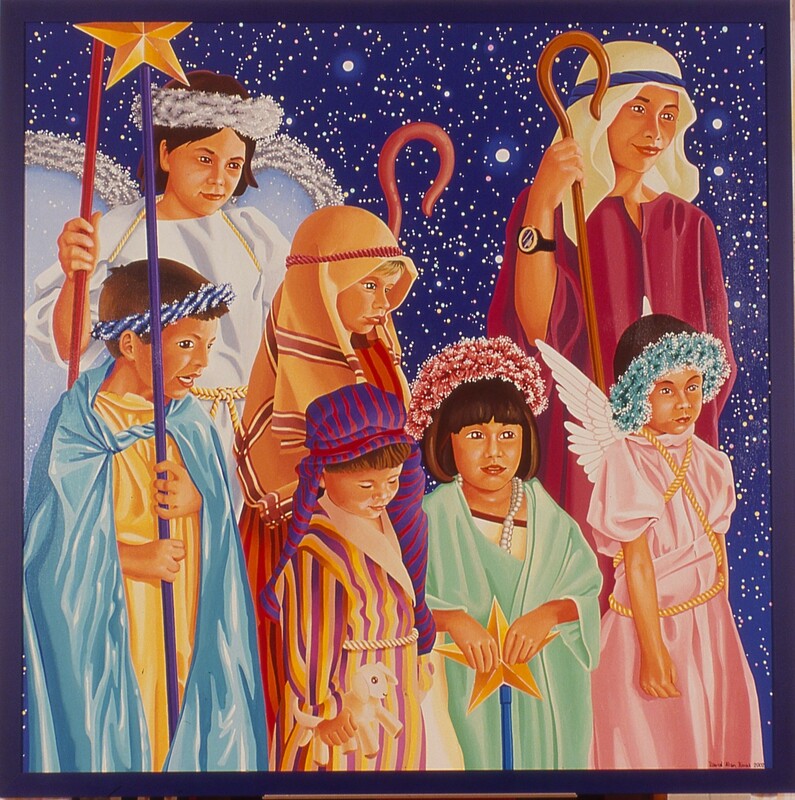 Looking at, pondering and enjoying these works can be part of the Advent to Christmas journey for each one of us. 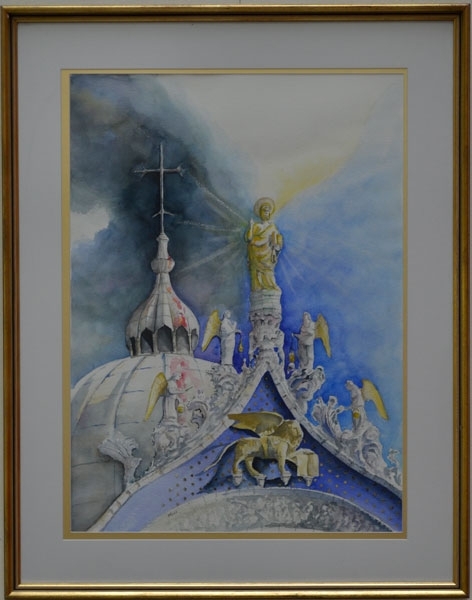 The artists of Visionaries offer these works (paintings in a range of media, drawings and a paper-cut) as a contribution towards the spiritual journey of viewers during Advent to Christmas, for reflection which may lead into prayer and new God-given insights. Visionaries artists also thank the minister, congregation and particularly the people who organise the Vera Wade Gallery of St Andrew’s Uniting Church for the opportunity to hold this exhibition.